Albion wing wizard Anthony Knockaert was tonight crowned the EFL Championship player of the season. 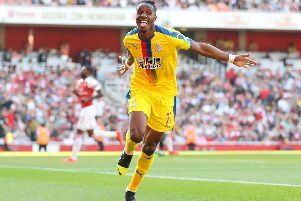 The 25-year-old has been in sparkling form for the table-topping Seagulls this season, netting 13 goals and providing eight assists. The Albion fans' favourite won the award at the EFL Awards in London ahead of Leeds striker Chris Wood, who has scored 27 goals this season, and Newcastle forward Dwight Gayle, who has struck 22 times. Knockaert had already been named in the Championship team of the year, alongside team-mates David Stockdale, Lewis Dunk and Glenn Murray. Knockaert and Stockdale were also named in the EFL team of the season, made up from all three divisions. Seagulls midfielder Steve Sidwell won the goal of the year award for the stunning strike from inside his own half at Bristol City in October. Sheffield United striker Billy Sharp won the League One player of the season award and Doncaster's John Marquis took the League Two award.